Technically speaking, this isn’t my stuff that is withering. My partner bought it at a garage sale a long time ago. It does work as a phone. I can’t remember if it rang. But I dropped it during some recent renovations, and it got that crack in the middle, so now it’s in our studio and is in this project. Claiming its new utility. 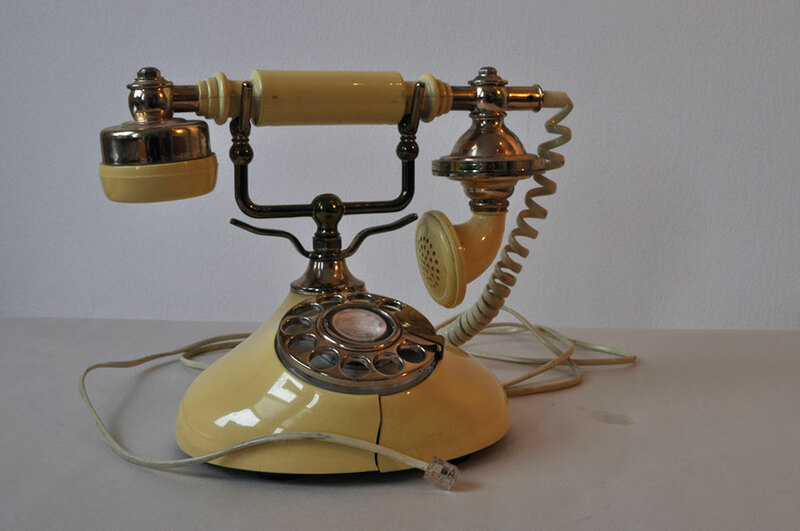 It’s really faux vintage – although that sounds funny as any rotary phone is vintage. A faux antique then. I like the lemon yellow. Mmmmm. In the photo, I get a creme caramel colour, nearly edible in it’s sensual gloss. (Reminiscent of my mother’s caramel pudding.) The shape very period, very female. Looks best against a neutral backdrop, as you have it, the line unobstructed by competition. The crack, je ne sais pas. It suggests it its own distinct history & character, … with possibilities of narrative. Trying to think of a film it would fit into. Perhaps one of the old David Niven black and white, romantic comedies. Lots of tuxedos and sheer, floating gowns.